Barbara Proksch (born 1943 in Berlin, living in Salching, Lower Bavaria) is a German visual artist. After having studied lettering and illustration, she first worked in graphic design and theatrical painting before in 1982 deciding to become a freelance artist, concerning herself mainly with drawing. Her works are characterized by her long-lasting fascination for letters and geometrical figures. Another thread of influence stems from her background in theatrical painting: the body language and the physical aspects of painting. From the beginning, a further aspect has drawn her attention, namely the sounds that occur while drawing and writing, and the way they influence the resulting work. She noticed that the sounds made by the tools she uses feed back into her drawing process, and that just like speech and writing -- in a linguistic sense -- cannot be decoupled from each other, drawing and listening cannot either: Eye and ear become partners, drawing becomes a performance with the specific tools and materials used as musical instruments. This observation has led to the development of her group of works called Opto_Phon, a name which, from the 1990s onwards, Proksch uses for performances that draw upon this synaesthetic process: Usually, Proksch works on large sheets of paper mounted like drumheads and treated with various tools (scrapers, brushes, pens, knives, twigs, etc. ), the sounds amplified through contact microphones. The early Opto_Phon performances were made with herself standing in front of the paper sheets, visible to the audience while drawing. Later, she decided to stand in the back of the paper with a spotlight behind her, so that light shines through it while it is being cut and ripped. Side A of this LP contains excerpts from Opto_Phon performances, the first made in a church in Cheb, Czechia, in 2003, led by the strong echo emerging in the hall, the others recorded in her studio. They are contrasted on side B with a very different performance that is, however, conceptually related to Opto_Phon: While travelling on the Trans-Siberian Railway, Proksch experienced a similar synaesthetic process while listening to the repetitive rattling of the train and watching the landscape passing by. In 2010, this experience was transformed into a sound piece for amplified sewing machine. Full-color sleeve with printed inner sleeve and insert, containing images of optophonic tools and drawings, and extensive liner notes; Edition of 300. Ernstalbrecht Stiebler (b. 1934) is a German composer of minimalist and reductionist contemporary music. Since the early 1960s, he has been developing a unique compositional style that draws on minimalist structures and repetitions, though not in any way related to the so-called minimal music, but rather influenced by minimalism in visual art and characterized by long static tones that slowly change and evolve over the course of a piece. Stiebler has composed for solo instruments as well as for different chamber musical and orchestral line-ups. Many of his ensemble pieces are built around long tones coming together in specific intervals, often alternating between dissonance and harmony, sometimes involving microtonal structures. Often, the single instruments are hard to distinguish, instead the musical space opened up by the complex harmonies, disharmonies and pulses of interference becomes the focus of listening. This double-LP collects four live recordings of pieces journeying "between the tones" ("Zwischen den Tönen"): "Intervall 19" and "Slow Motion", composed in 1997 and 2003, respectively, are apt examples of Stiebler's style employed for chamber ensembles, with static tones putting every tonal nuance under microscopic view, and slow movement allowing for observation of the slightest variations. The third piece, "Zwischen den Tönen" (1997) is an anomaly in his oeuvre in that it makes use of his distinct techniques but is written for women's choir. The edition is rounded off by a recent recording, "ortung" (2018), again for chamber ensemble, that displays a newfound ease and compositional intuition that has become apparent in his recent work. All recordings are previously unreleased. Single sleeve with two printed inner sleeves; Liner notes in German and English by Matthias R. Entreß and Ernstalbrecht Stiebler; Edition of 300. From the liner notes by Matthias R. Entreß: "With great concentration the essence of sound becomes clear in Stiebler's late work, here in the heyday of his advanced age, and this has brought his music to the listeners and locations of the alternative avant-garde of noise, ambient and the real-time music scene, in which a culture of heartfelt dedication to sound has long existed. The fact that Stiebler's initiation of precise listening also constitutes a challenge to the cultivation of classical music (he is a great admirer of Mozart) has not yet been properly recognized." Robin Hayward (b. 1969 in Brighton, England) is a tuba player and composer based in Berlin. Since the 1990s, he has been concerning himself with experimental and radical playing techniques on brass instruments, initially through the discovery of the "noise-valve", later through development of the first fully microtonal tuba in 2009. In 2012, he invented the Hayward Tuning Vine as an interface for exploring the harmonic space implicit within the instrument, which exists both as a software version and as a physical prototype. Hayward's microtonal tuba and, on some occasions, the tuning vine have appeared on numerous recordings with various ensembles, e.g. Tonaliens -- who released a double-LP on Edition Telemark in 2017 (ET 785-02LP) --, Chora(s)san Time-Court Mirage, and Microtub. Words of Paradise is a 2016 recording performed by Zinc & Copper, Hayward's long-running brass chamber ensemble, featuring himself on tuba and tuning vine, Hilary Jeffery on trombone, and Elena Kakaliagou on horn. The piece was inspired by the ideas of 16th-century Dutch linguist Johannes Goropius Becanus, who thought he had shown the Flemish dialect Brabantic to be the original language spoken in Paradise. Observing Brabantic to have a higher proportion of single-syllable words compared to other languages, he reasoned that as the first language must have been the simplest, all languages must be derived from it. The composition draws on the sound of 13 single-syllable words that Becanus used to support his theories. Using half-valve and muting techniques, the inflections of speech and vowel sounds are imitated on the brass instruments, to which the Hayward Tuning Vine is played as a harmonic reference. Comes on LP picture disc replicating the multi-colored circular scores of the horn and trombone parts of Words of Paradise; housed in a black die-cut sleeve with liner notes on the rear side; Edition of 300. Small Worlds (2004) is a 42-minute composition for improvising sextet by Austrian double bassist, composer and improviser Werner Dafeldecker. The score is written for any instrument and divides the players into two virtual trios whose constellations change every three minutes. No restrictions are made regarding material or playing techniques, the only specification is that in each three-minute trio, one player has the role of the "dynamic leader" which means that no other player within the trio should play louder than the one on that leading position. Apart from that, the only other restriction concerns how pauses are to be made when two players interchange their positions within the trios. According to Dafeldecker, the object of the piece is to provide a structure that doesn't curtail the qualities of the musicians, yet forces them to listen very closely to each other and make focused decisions about parameters that are often overlooked in completely free improvisation. Especially, the given structure avoids the emergence of certain clichés that are often present in free improvisation, while retaining a very high level of openness with regard to how the piece is performed. The first published recording of Small Worlds, by Australian ensemble Quiver, was released in 2017 on CDr by Tone List. This LP contains a recording made in 2004 at Taktlos Festival in Basel, Switzerland, that features the line-up that Dafeldecker originally had in mind when he wrote the piece: Burkhard Beins (percussion), Martin Brandlmayr (percussion), Werner Dafeldecker (double bass), Klaus Lang (organ), Michael Moser (cello), and John Tilbury (piano). Partly, this constellation later also played together in the long-running avant-garde group Polwechsel. Comes in sleeve with three inserts: two featuring an extensive conversation between Werner Dafeldecker and Matthias Haenisch discussing Small Worlds, Polwechsel and free improvisation in general (German and English), the third reproducing the score of the piece; Edition of 300. William Engelen (born 1964 in Weert, The Netherlands) is a sound and visual artist living and working in Berlin. After having studied visual arts, his focus shifted over time from solely visual to multi-disciplinary works that oscillate between sound and visual arts, between exhibition and performance, and incorporate installation, sculptural, and compositional elements. He now considers himself a conceptual artist who works with sound. Many of his works are site-specific and have been presented and performed in museums, galleries, concert halls, private apartments, parks, urban spaces, amongst others. Unlike other sound artists, Engelen does not primarily try to make a space sound, but rather develops works that resonate and reflect the specific surroundings where they are presented. Today, The Organ Has Played Beautifully Again (2018) is Engelen's second LP release after Partitur Belval in 2016. The piece was written for his solo exhibition "Heute Hat Die Orgel Wieder Schön Gespielt" at Kunsthalle Osnabrück in Lower Saxony, Germany. The Kunsthalle building was once a Dominican monastery which, in 1713, became home to a pipe organ made by the famous Klausing workshop in Herford. In 1819, after the monastery had been secularized, the organ was moved to St. Matthäus church in Melle where it continues to be played to the present day. For the exhibition, Engelen decided to virtually bring back the organ to its original place. The piece was performed first for an audience at St. Mätthaus church on October 14th, 2018, then turned into an 8-channel sound installation for the Kunsthalle exhibition from November 2018 to January 2019. During the rehearsals and the concert, video recordings were made that were compiled into a 2-channel work. The fourth iteration of the piece is this double-LP album, recorded in the night of October 18th, 2018. Co-released by Kunsthalle Osnabrück and Edition Telemark. Full-color gatefold sleeve; printed inner sleeves. William Engelen: "The air supply for this historic instrument can either be pumped by a motor or by sheer force, literally by stepping or pressing on the large bellows. Together with Stephan Lutermann, the church's regular organist, I explored and pushed the sonic boundaries and possibilities of the Klausing organ -- from the barely audible to the astonishingly raucous. While Stephan played the console, I served as the so-called calcant, or bellows blower, and in this role could decide the length and force of the air supply. Only four of the twelve parts are played with the help of the motor." Takako Saito (born 1929) is a Japanese artist closely related with Fluxus. In the 1950s, she participated in the "Creative Art Education" movement where she met later Fluxus fellow Ay-O. In 1963, she moved to New York where she was introduced to George Maciunas and became an important member of the Fluxus movement. Much of her work revolves around everyday life and everyday things, to which she adds her unique artistic gesture through small but deliberate and carefully crafted interventions. Many of her pieces involve the participation of viewers and only become complete when the audience fills a co-designing role. A sense of playfulness is evident throughout her work, seen in many of her performances and particularly in her various "free" chess games. In line with her general artistic approach, Saito recorded a number of musical pieces between 1982 and 1992. Retrospectively, she called these recordings "Spontaneous Music" because they involved very simple actions with voice and everyday objects that happened spontaneously. Some recordings have become part of sound pieces in her exhibition "Games" at Emily Harvey Gallery in New York in 1990, but none of them have been released so far. A selection from the recordings is published here for the first time. This double LP includes two solo vocal pieces: "Tarori Po Po Po" and "Isokono Pasokono"; two more vocal pieces in which Saito's voice interacts with the sounds of an everyday event: "Toro Während Des Naturreiskochens" (Toro While Cooking Brown Rice) and "Mit Elektrohammer" (With Electric Hammer); and two non-vocal sound pieces: "Kugeln" (Balls) and "Am Rhein Mit Hammer" (At The Rhine With Hammer). All recordings have been carefully digitized and mastered by Dirk Specht. Housed in a full-color sleeve; includes one insert with liner notes by Saito, a poster, and four postcards all designed by Takako Saito specifically for this release and relate to the notion of the music having been created simply with one's mouth and hands. Edition of 300. From Takako Saito's liner notes: "Around me, there are many things that make beautiful sounds. When I look outside through the window in front of my desk, I see a big Platanus tree whose leaves are shaking. When you stick a microphone into the leaves, it should made beautiful sounds. Then sometimes a dog passes by and barks. [...] That is music to me. No matter if one notices it or not: it's different but it's there." Edition Telemark presents the ninth album by die ANGEL (pronounced [diː ˈaŋl̩], previously called Angel), an improvisational noise and electro-acoustic project founded in 1999 by Dirk Dresselhaus and Ilpo Väisänen. Dresselhaus, aka Schneider TM, is based in Berlin and has been active in electric and electronic music since the late 1980s in various bands and projects ranging from rock music to electro-acoustic improvisation. Väisänen has been playing in Finnish electronic duo Pan Sonic in the 1990s and 2000s, and, more recently, in a number of solo projects. die ANGEL's music meanders between the poles of improvised noise and electro-acoustic music, encompassing processed electronic sounds, instruments, and field recordings, with some tracks featuring guest musicians. Yön Magneetti Sine can be considered their most stripped-down album to date, completely recorded in July 2017 in Väisänen's cottage near Karttula, Finland. It contains five improvised tracks featuring only processed acoustic signals from two self-built one-string resonance instruments and an acoustic guitar. Both one-stringed instruments were built by Väisänen from parts of a weaving loom, a bench, and two barbecue bowls. All tracks were recorded live without overdubs and, according to Dresselhaus and Väisänen, relate directly to the surrounding landscape and the special atmosphere of the white nights that occur in central and northern Finland during summer. To them, the music heard here is to be called blues, albeit with non-standard instrumentation and structure. Thus, their working title has been "The Electro-Acoustic Blues Album". Edition of 300; blue vinyl in full-color sleeve with various photos of the recording process and the surroundings. The Maciunas Ensemble was founded in Eindhoven, The Netherlands, in 1968 as a free improvisational music group that set out to realize the score "Music for Everyman" by Fluxus initiator George Maciunas, which they interpreted as allowing total freedom in the sounds being produced. In the mid-1980s, after a number of personnel changes, the group settled on the line-up of artists Paul Panhuysen and Mario van Horrik, musician Jan van Riet, and scientist Leon van Noorden, which remained stable until Panhuysen's death in 2015. The group met and played on a regular basis, usually improvising on instruments that were at hand and recording every session. Before playing the next session, the previous recording was listened to and discussed. In 1980, the Eindhoven art initiative Het Apollohuis, also the home of Panhuysen and his family, became their home base, a place that subsequently gained fame for being one of the first and longest-running venues for sound art and experimental music in Europe. In the recent years, the Maciunas Ensemble has begun to go through its vast archive of recordings and to select material for publication that remained unreleased so far. The first bundle of archival recordings, dating from 1968 to 1980, was released on an 11-CD set on Apollo Records in 2012. For their 50th anniversary in 2018, the second part of archival recordings is to be published, its first instalment being this LP on Edition Telemark comprising unreleased tracks recorded between 1982 and 2012. More archival material will be released in digital format by the ensemble. This LP allows a glimpse into the musical directions the Maciunas Ensemble has been undergoing during those 30 years. Side A features "Ice Cream Man" and "Toxic Metals", two repetitive, thundering tracks from the early 1980s played on guitar, piano, and cello, and heavily inspired by minimalist rock and post-punk music. Side B contains four shorter tracks: "Russolution" (1985), played on self-built aluminum monochords, "Stamples" (2002), employing sampled voices, and "ZENder" (2009) and "Dèdeboum" (2012), both improvised tracks on vocals and a number of instruments. Standard edition of 250; brown Kraftpak sleeve with printed inner sleeve and liner notes by Mark van de Voort and Werner Durand. Special edition in paper bag with t-shirt and sticker. The Maciunas Ensemble was founded in Eindhoven, The Netherlands, in 1968 as a free improvisational music group that set out to realize the score "Music for Everyman" by Fluxus initiator George Maciunas, which they interpreted as allowing total freedom in the sounds being produced. In the mid-1980s, after a number of personnel changes, the group settled on the line-up of artists Paul Panhuysen and Mario van Horrik, musician Jan van Riet, and scientist Leon van Noorden, which remained stable until Panhuysen's death in 2015. The group met and played on a regular basis, usually improvising on instruments that were at hand and recording every session. Before playing the next session, the previous recording was listened to and discussed. In 1980, the Eindhoven art initiative Het Apollohuis, also the home of Panhuysen and his family, became their home base, a place that subsequently gained fame for being one of the first and longest-running venues for sound art and experimental music in Europe. In the recent years, the Maciunas Ensemble has begun to go through its vast archive of recordings and to select material for publication that remained unreleased so far. The first bundle of archival recordings, dating from 1968 to 1980, was released on an 11-CD set on Apollo Records in 2012. For their 50th anniversary in 2018, the second part of archival recordings is to be published, its first instalment being this LP on Edition Telemark comprising unreleased tracks recorded between 1982 and 2012. More archival material will be released in digital format by the ensemble. This LP allows a glimpse into the musical directions the Maciunas Ensemble has been undergoing during those 30 years. Side A features "Ice Cream Man" and "Toxic Metals", two repetitive, thundering tracks from the early 1980s played on guitar, piano, and cello, and heavily inspired by minimalist rock and post-punk music. Side B contains four shorter tracks: "Russolution" (1985), played on self-built aluminum monochords, "Stamples" (2002), employing sampled voices, and "ZENder" (2009) and "Dèdeboum" (2012), both improvised tracks on vocals and a number of instruments. "Radiophonic minutes of the search for a probably lost tape piece, and a reconstruction thereof with real instruments." Produced by Hessischer Rundfunk (Hessian Broadcasting Corporation), Germany, in 2015. When future Fluxus artist Ben Patterson (1934-2016) traveled to Germany in 1960 in order to study with Karlheinz Stockhausen, he brought along a tape piece that he had produced in Hugh Le Caine's electronic studio in Canada and that he wanted to show to Stockhausen. They met briefly in the context of the World Music Days of the International Society for Contemporary Music (ISCM) in Cologne, but Patterson immediately sensed that their aesthetic ambitions and viewpoints differed too much, and in the end, he didn't even present him his piece. Instead, his attention was drawn to the Contre Festival at Mary Bauermeister's studio, a counter event to the ISCM festival presenting works by George Brecht, La Monte Young, John Cage, amongst others. Virtually overnight, Patterson's aesthetic thinking changed radically, and the cornerstone was laid for his coming role within the Fluxus movement. In 2013, Stefan Fricke, editor for new music at Hessischer Rundfunk, approached Patterson about a broadcast of that old tape piece. Patterson didn't know its whereabouts, so Fricke and him together with Cologne-based composer hans w. koch set out for a journey through Patterson's large collection of tapes, some labeled, some unlabeled, sometimes the labels not matching the contents. The journey was recorded with Patterson inserting and ejecting various cassettes, always commenting on what was being heard. In the end, the electronic piece couldn't be found, so it was decided to re-record it using various toys, instruments, and small devices. For the new recording, Patterson brought a score titled "The Three Required Musics" which he considered to be related to the tape piece and which required preparatory work in the form of cutting out colored pieces of paper and pasting them into a time grid. This LP contains the recording of the search on side A and the new recording of the score on side B. It is presented in a full-color sleeve showing a detail of hans w. koch's paper time grid, with liner notes by Stefan Fricke and hans w. koch, and two inserts: the first containing the original score "The Three Required Musics" with new notes by Ben Patterson, the other reproducing koch's complete paper score in A2 format. Edition of 300.
hans w. koch (b. 1962) is a Cologne-based composer, performer, and sound artist. His work encompasses pieces for chamber and large orchestra, experimental scores for instruments, computers and everyday objects, sound installations, electronic music, etc. He summarizes his art as being about sculpting thoughts in diverse material and prefers conceptual approaches: "more thought, less material". koch studied composition with Johannes Fritsch and currently is professor for sound at the Academy of Media Arts Cologne. Since the 1980s, koch has been concerning himself with the concept of "total harmony" (harmonie totale) introduced by Russian composer Nikolai Obouhow (1892-1954) where all twelve tones of the Western tonal system -- in different octave ranges -- are stacked into chord complexes, thus articulating the idea of a vertical twelve-tone music, as opposed to the horizontal twelve-tone music after Schönberg. Less than the mystical connotations expressed by Obouhow, koch is interested in the conceptual potential of this approach: a self-contained harmonic system in which every chord is an inversion of every other. koch has made several works relating to total harmony and calls this work group "the O. theorem". This LP presents two pieces within this group: "stele fuer n.o." for large orchestra (2010) was premiered at the festival MaerzMusik in Berlin in 2010 with the Konzerthausorchester Berlin. "clock of fifths [totensonntag]" (2017) is an electronic piece where a field recording of church bells is filtered through a smartphone app developed by koch: The microphone signal is divided into twelve tone pitches that are heard in accordance with a timer that moves through the circle of fifths shown on the smartphone display. Full-color sleeve; includes printed inner sleeve with liner notes by Volker Straebel and hans w. koch. Edition of 300. Limited restock, last copies... Editions Telemark offer a first-time vinyl reissue of Joe Jones's Solar Music Tent, originally released on cassette in 1982. Documenting an installation and performance in Hagen, Germany, Solar Music Tent, was self-released by in in an edition of ten copies. From the early 1980s onwards, Jones released a handful of these self-recorded music machine performances on tape under his own record label, Tone-Deaf Music. Most tapes came in a standard xeroxed sleeve with a handwritten title and instrument listing. A few, including Solar Music Tent, were released in combination with a book. Solar Music Tent was included in a red ring binder that held a handwritten photo documentation of the performance of the same name at Karl-Ernst-Osthaus-Museum in Hagen on April 1, 1982, a handwritten music notebook, and an invitation card. 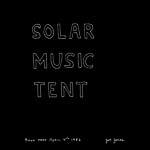 The recording itself was titled "Solar Music #5" and was made on March 16, 1982, with the instrument ensemble of the Solar Music Tent at Jones's apartment in Düsseldorf. Comes in a gatefold, PVC sleeve; Includes A4-sized facsimiles of all original artwork; Edition of 200. After two LPs in 2014 and 2017, Edition Telemark now turns to the group of works that is probably the most well-known within the vast oeuvre of Dutch sound and visual artist Paul Panhuysen (1934-2015): his long string installations. Using this term, he referred to all of his works involving strings and sounds. They were realized all around the world between 1982 and 2012 -- until 1991 mostly together with Johan Goedhart --, each installation made specifically for the site where it was displayed. Unlike other artists working with long strings around the same time, e.g. Ellen Fullman and Terry Fox, Panhuysen's strings were instruments or performative material only secondarily. Rather, his installations can be considered sculptural and sounding events in space, operating in between two lines of tradition, constructivism and situationism, that are evident also in many other parts of his oeuvre. The first recordings of Panhuysen's long string installations were published in the 1980s, most famously on a three-LP box set edited on Apollo Records in 1986. This new three-LP set includes solely unreleased recordings made between 1982 and 2012, with one recording added posthumously in 2017. It is presented in a triple gatefold sleeve with printed inner sleeves containing liner notes by Rolf Sachsse and Stephan Wunderlich as well as various high-resolution photos. Regular version comes in an edition of 250. Herman de Vries on the record: "At the summer party on the occasion of my soon-to-be 80th birthday, many friends came. As it said on the invitation: 'the Eschenau Chaos Band will play.' while the party was going on, people asked me when that band would be playing, and I replied: 'Now! You are that band', and I randomly handed out all of these instruments. Hartmut Geerken was clued in and had brought some as well -- Sun Ra's sun harp among others. I started with a Moroccan hand drum, bendir, and off it went. unpracticed." Herman de Vries, born 1931 in Alkmaar, is a Dutch visual artist who has been living in Eschenau in the Steigerwald region (Franconia, Germany) since 1970. Having started out as an Art Informel painter in the 1950s, his interests shifted in the ensuing years, and in the 1970s, he became focused on found objects from nature and their artistic-philosophical qualities and implications. He has made paintings, collages, texts, sculptures, installations, among other art, and has dealt with plants, earth, and other parts of nature from botanical, medical, historical, as well as psychedelic viewpoints. The recording here was made on June 18, 2011, in Eschenau. Includes liner notes by Herman de Vries and photos of the event on the back sleeve; Edition of 300. Tonaliens is a Berlin-based group investigating the inner dimensions and outer limits of just intonation. It was formed in 2014 by Amelia Cuni (voice), Werner Durand (invented wind instruments), Robin Hayward (microtonal tuba), Hilary Jeffery (trombone), and Ralf Meinz (live sound, electronics). The group came together shortly after the release of the software version of the Hayward Tuning Vine, an interface for exploring microtonal tuning that allows for direct and intuitive interaction with the pitches normally hidden between the keys of the piano. Coming from diverse backgrounds, the musicians were eager to explore this harmonic space, and thus the tuning vine, as Hayward put it "acted first as a catalyst, then as a map, and finally as a spaceship" that enabled them to navigate those areas that largely remain obscured. The music of Tonaliens has so far been focused on a very specific area within the microtonal space that was discovered by mapping out the first three harmonics of three tubes of Durand's self-invented Pan-Ney instrument. They named this area the Tonaliens chord, and both recordings on this double LP -- two live performances from 2015 -- are based on it. Sides A and B are recorded live in a church in Amsterdam, the Vondelkerk, during the Sonic Acts Festival. Sides C and D contain a contrasting, more intimate performance made at KuLe in Berlin for the Labor Sonor concert series. Amelia Cuni appears only on the Amsterdam recording. Full-color gatefold sleeve with liner notes by Robin Hayward, and detailed photos and screenshots; Black poly-lined inner sleeves; Edition of 300. The Oval Language is an autonomous art project founded in 1987 in Leipzig, East Germany, by Klaus-Peter John and Frank Berendt, and continued to this day by John. Its fields of activity are multifaceted and have included sound-noise performances, conceptual works in open spaces, installations, land art projects, photography, etc. The Oval Language has collaborated extensively with various artists, among others Nicolai Angelov, Koyo Axel Guhlmann, and Guido Hübner of Das Synthetische Mischgewebe. Around 1991, the then members of the group -- John, Berendt, and Peter Schüler -- were exploring the irrational impact of the Monument to the Battle of the Nations (Völkerschlachtdenkmal) near Leipzig and presented the tri-media project Hibernation, based around their attempts at approaching the undercurrents that are conserved within the imagery associated with the monument. Hibernation comprised live performances at the Academy of Fine Arts Leipzig (Hochschule für Grafik und Buchkunst, HGB) and at the Museum of Ethnography, an event sculpture in front of the monument which involved the burning of large amounts of straw, and an installation at the briquette factory Zechau near Altenburg. The Oval Language on the project: "Hibernation is about the Monument to the Battle of the Nations near Leipzig. We don't look at it through the historical prism of the 1813 Battle of the Nations, though. We are concerned with the monument as a Gesamtkunstwerk, as a manifestation of irrational German thinking in previous times and its impact on today's generation." This LP reproduces the sound layer of Hibernation and includes a recording of a live performance at the HGB, made in 1991. Printed inner sleeve with photos of each stage of the project and texts; Edition of 300. Thomas Müller (b. 1970 in Munich) is a Berlin-based video artist, experimental musician, painter, and photographer. For an exhibition in 2005, he burned three of his oil paintings and displayed the resulting pile of ashes as a sculpture entitled "three of my favourite pictures". These particular ashes were reused in new paintings, some of which have again been burned to produce further ashes for further paintings. Thus began a cycle of ash-based works entitled "not a bird", ranging from large canvas paintings to postcards, sometimes enriched with pigment. The paintings were used as source material for video installations and exhibitions, or simply burned to produce more ashes. Müller considers the process of burning and the resulting ashes as a means of transcendence and purification. For this reason, he only uses the ashes of objects related to himself. This LP brings together "not a bird" and Müller's long-time preoccupation with Richard Wagner's Das Rheingold. The piece, originally conceived as a video, consists of countless layers of Das Rheingold recordings, with side A using the beginning of each recording and side B using the end of each. Side A plays outside-in, side B plays inside-out. The outer and inner sleeves show slightly enlarged facsimiles of four ash-painted postcards. Standard version comes in an edition of 250. Limited version. Comes with a large hand-drilled off-center hole (diameter 27mm) for additional wobbling during playback and a small bag of original "not a bird" ashes to be scattered over the LP before playing (Note: The limited version is not playable by regular means); Edition of 50 (numbered). Thomas Müller (b. 1970 in Munich) is a Berlin-based video artist, experimental musician, painter, and photographer. For an exhibition in 2005, he burned three of his oil paintings and displayed the resulting pile of ashes as a sculpture entitled "three of my favourite pictures". These particular ashes were reused in new paintings, some of which have again been burned to produce further ashes for further paintings. Thus began a cycle of ash-based works entitled "not a bird", ranging from large canvas paintings to postcards, sometimes enriched with pigment. The paintings were used as source material for video installations and exhibitions, or simply burned to produce more ashes. Müller considers the process of burning and the resulting ashes as a means of transcendence and purification. For this reason, he only uses the ashes of objects related to himself. This LP brings together "not a bird" and Müller's long-time preoccupation with Richard Wagner's Das Rheingold. The piece, originally conceived as a video, consists of countless layers of Das Rheingold recordings, with side A using the beginning of each recording and side B using the end of each. Side A plays outside-in, side B plays inside-out. The outer and inner sleeves show slightly enlarged facsimiles of four ash-painted postcards. Carillon Sudokus is the sonic counterpart to Oog & Oor (Eye & Ear), the last work that Dutch sound and visual artist Paul Panhuysen (1934-2015) realized. Oog & Oor was a design made with his daughter Sappho Panhuysen for a temporary installation in the lighted column of the Rietveld bus shelter next to the town hall of Eindhoven. It is a further development from Eight Double Sudokus, a series of large-scale prints exhibited at Museum De Pont in Tilburg in 2012. Both designs were created using sudoku puzzles and comprise various shapes of different colors whose structure was derived from the number sequences present in individual sudokus. Panhuysen used number systems such as magic squares, the Fibonacci series and the golden ratio in much of his art because he felt that instead of limiting his artistic freedom, such systems allowed him to make new discoveries and realize works that transcended his own imagination. René van Peer describes the composition in the liner notes: "A system is evidently at work behind the order of colours and shapes in these prints. On the other hand it is far from obvious what the underlying order actually is. Coloured bands and arcs converge in a rhythmic play of lines. Some originate from the same point, joining to form a right angle or part of a circle. Others touch only at the point or remain loose ends in a wave of motion. The orderliness of the structure and the erratic behaviour of the straight and curved lines strive for predominance in the series." These principles can also be applied to pitch and musical phrases. For Eight Double Sudokus, Panhuysen composed eight pieces for piano that were heard during the exhibition. For Oog & Oor, he envisioned music for the carillon, a bell tower on the roof of the Eindhoven town hall. The original idea was to generate 365 sudoku-based pieces, one for each day of the year that the installation was to be shown. In the end, around 50 pieces were realized in collaboration with town carillonneur Rosemarie Seuntiëns. Side A of this LP contains 11 pieces played live by Seuntiëns on the ceremonial ending of Oog & Oor on August 28, 2015. 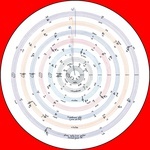 Side B features 12 pieces played mechanically by the carillon. Comes in full-color gatefold sleeve with printed inner sleeve; Liner notes by René van Peer; Edition of 300. Ernstalbrecht Stiebler (b. 1934) is a German composer of minimalist and reductionist contemporary music. His name is still most closely associated with his long-time position as radio editor and producer for New Music at the Hessian Broadcasting Corporation (Hessischer Rundfunk), but his own compositional oeuvre -- beginning in 1955 and continuing until now -- has, in recent years, attracted more attention with various concerts and several releases. Having attended the Darmstadt International Summer Courses for New Music from 1958 onwards, Stiebler decided in 1963 to leave serial music behind and opted instead for his own reductionist style built on minimalist structures and repetitions, though not in any way related to the so-called minimal music but rather influenced by minimalism in visual art. In terms of composers of his time, the closest stylistic relationship that could be drawn is to Morton Feldman. Stiebler's approach is best summarized in his own words: "Music is too important to burden it with emotions." This LP pairs two organ-based works: "Kanon" (1980) for organ, electric organ and wind instruments, and "Torsi" (2002) for organ in three movements: "Torso", "Organa minima", and "Cantus". The latter recording, made at St. Stephen's Church in Konstanz (organ: Hans-Peter Schulz), was previously released on CD by m=minimal (MINIMAL 017CD, 2013). "Kanon" is a previously unreleased recording. Includes an extensive interview conducted by Jens Strüver about Stiebler's compositional views and techniques. Gatefold sleeve; Edition of 300. Peter Behrendsen (b. 1943) is a Cologne-based radio producer, performer, and composer of experimental music. He started concerning himself with electro-acoustic music in 1972. He was a member of Josef Anton Riedl's ensemble and an assistant to Klaus Schöning at the WDR radio play studio (Studio for Acoustic Art). In Cologne, he organized numerous concerts and festivals for experimental music, most notably BrückenMusik, a series of concerts in the box girder of the Deutz bridge. He regards John Cage, Alvin Lucier, Jackson Mac Low, and David Tudor as his most important teachers, with whom he also collaborated, and has performed his own live-electronic and text-sound compositions throughout Europe. This LP pairs a live-electronic and a text-sound piece: "Nachtflug" ("Night Flight", 1999) is based on electronic treatment of the sounds of bats made audible, and is performed by Hans W. Koch and Behrendsen. "Atem des Windes" ("Breath of Wind", 1999-2005) is a text-sound composition on the subject of the wind, inspired by a Taoist text by the Chinese philosopher Zhuangzi, and features the voices of Bettina Wenzel and Behrendsen. Full-color sleeve and inner sleeve; Edition of 300. The trio Argo was formed in Darmstadt in 1985 by Hans Essel (violin), Marit Hoffmann (viola), and Thomas Stett (clarinet). It existed until 2016 when it was forced to an end by the untimely death of Stett. Argo set out to explore new ways of free collective improvisation that were aimed neither at personal expressivity, nor at the evocation of a certain mood or atmosphere. Eschewing any compositional agreements, they experimented with musical forms and processes that emerged spontaneously between the poles of the players's individual lines of improvisation. They played with fleeting objects of sound and transformations, inflections, and disruptions of those objects. Unexpected noises that could arise at any time required and provoked fast reactions of the players. Argo utilized three classical instruments without any preparations but over time, developed an augmented range of sound generation techniques on these instruments. Their playing bears almost no traces of tonality, harmony, or rhythm. The title of this edition, Flüchtige Musik, translates as "fleeting music" or "transient music". The double LP collects recordings made mostly live between 1987 and 2013. The first recording still shows traces of classical sound material but also includes other sound generators like styrofoam and cardboard that were left out later. Already in 1991, Argo had settled on using the three instruments exclusively but with a new range of sounds that can be heard throughout the subsequent recordings. On a few occasions, Argo transferred their concept to experiments with their own speaking voices. This led to "Flüchtige Wörter" ("fleeting words"), one recording of which is also included. Double LP in gatefold sleeve with black poly-lined inner sleeves; Edition of 300. Amelia Cuni was born in Milan and has lived in India for more than ten years where she studied dhrupad singing with various renowned masters. Werner Durand has been performing his own music for saxophones, Iranian ney and self-made wind instruments since the late '70s. He started building his own wind instruments from plexi-glass, PVC and metal tubes in the early '80s and has performed in various groups including The Thirteenth Tribe and Armchair Traveller. Since the '90s, Cuni and Durand have been performing together as a duo as well as in collaborations such as Tonaliens and Born Of Six. Diasporagas, sub-titled "Ancient Trends and New Traditions in Indo-European Music", summarizes their various musical projects in which her Indian raga singing meets his minimalist and experimental approach. In all of their collaborations, they have been creating unique forms and expanding the palette of their sound worlds while keeping the essence of raga music, justifying the use of the term in its original meaning. The title is meant to be understood as a statement to provoke reflections on our ideas of cultural identity vs. globalization, and tradition vs. experimentation. A central Diasporagas work is "Hiss (Mastered Noise)" for dhrupad singing, invented wind instruments, Indian percussion and samples of historical recordings by Indian singers. It is partly based on their earlier work "Gramophone Saraswati" which involved replicas of Luigi Russolo's intonarumori instead of the Indian recordings. This LP includes "Hiss (Mastered Noise)" and two other pieces entitled "Aqua Shiva" and "Agana Song". Comes in a full-color sleeve with a printed inner sleeve reproducing the score of "Hiss (Mastered Noise)". Edition of 300. Petra Dubach and Mario van Horrik have been working together as an artistic duo in Eindhoven since 1983. Originally, they combined dance and music in concerts, performances and theater pieces, Dubach being a dancer and van Horrik making music. Mario van Horrik is also a long-time member of the Maciunas Ensemble alongside Paul Panhuysen et al. Dubach's and van Horrik's starting point was the notion that movement and sound are essentially the same: If there is no movement (vibration), nothing can be heard; if there is no sound, nothing moves. Over the years, the boundaries between movement and sound in their work became more and more blurred while they worked out their root idea in every thinkable form, ranging from installations and site-specific works to performances and concerts. In 2010, they started their ongoing research project Waves which involves producing movement feedback using shakers, a kind of loudspeakers that reproduce sound frequencies as vibrations, attached to long strings. Over the years, they have made numerous installations and concerts based upon this concept and have experimented with all sorts of objects incorporated into the basic Waves setup, including Chinese lanterns, hooks, loose strings etc. This edition gathers four recordings of different Waves installations, all made in Dubach's and van Horrik's private studio in Eindhoven. It is presented as a double 12 inch set (45 rpm) with a full-color gatefold sleeve and liner notes by Milos Vojtěchovský. Edition of 300.